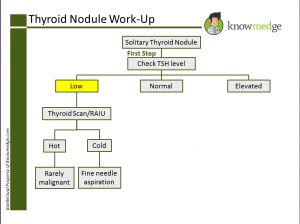 Interacting with residents studying for the ABIM Internal Medicine board exam, I have found that one of the topics folks often find frustrating to master is working up a thyroid nodule. 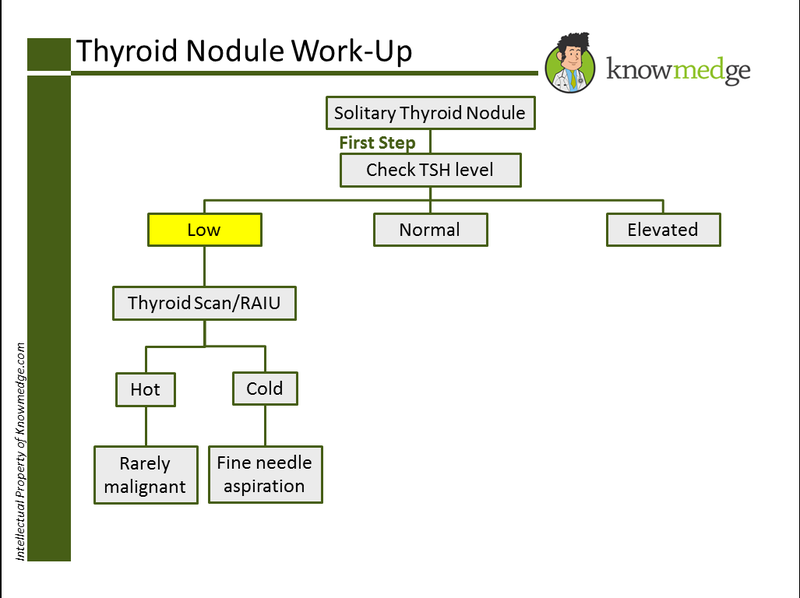 Dealing with a thyroid nodule can be intimidating initially but following a systematic algorithm makes it very simple. Thyroid nodules can be detected either on palpation during the physical examination or incidentally when imaging is performed. Some of the most common imaging studies that can detect a thyroid nodule are: carotid ultrasonography, CT scan of the neck, or PET scan. The initial workup of a thyroid nodule, whether discovered via physical exam or incidentally, is to check a TSH level. If a TSH level is normal or elevated, the next step is to check a thyroid ultrasound. A thyroid ultrasound yields important information such as accurate detection and sizing of all nodules of the thyroid gland. It will also help determine if a thyroid nodule is expected to be benign or malignant. If the thyroid nodule has a risk of being malignant, then ultrasound guided fine needle aspiration needs to be performed. These ultrasound characteristics warrant a fine needle aspiration to determine if a patient does indeed have underlying thyroid cancer. If the fine needle aspiration (FNA) is benign, then serial follow up is necessary. If the FNA yields indeterminate results, then a repeat ultrasound guided FNA is warranted. If FNA shows follicular neoplasm or suspicion for malignancy, surgical intervention is required. In the context of a suppressed TSH, a thyroid scan and radioactive iodine uptake (RAIU) scan are the next appropriate diagnostic tests to perform. These tests determine what portion of the thyroid gland is taking up radioactive tracer. Many times, a toxic nodule or multi-nodular goiter may be present. Uptake of radioactive tracer identifies the nodule as “hot” or hyper-functioning or “cold” and hypo-functioning. Hot nodules rarely harbor a malignancy potential as these nodules have less than one percent of being malignant. Cold nodules, on the other hand, are non-functioning as they do not take up the radioactive tracer and harbor a greater chance of malignancy. Therefore, these nodules require fine needle aspiration to determine if they are malignant or not. 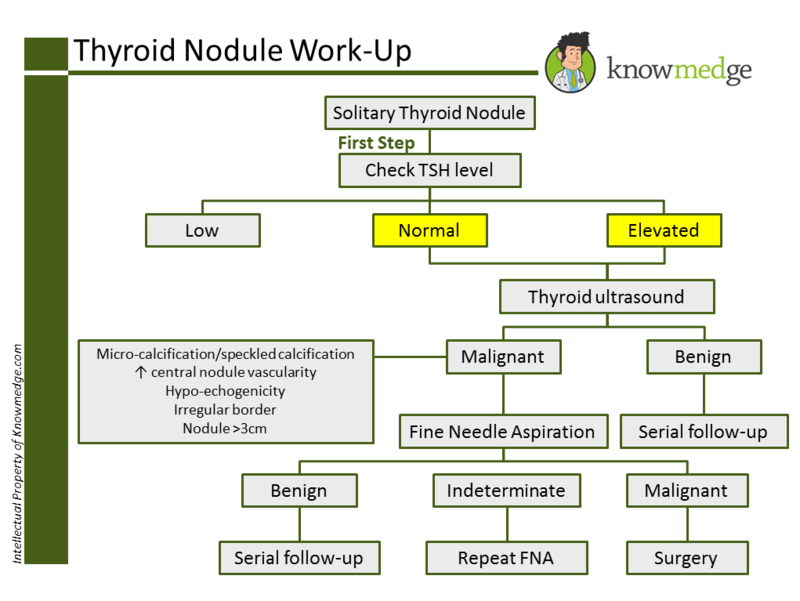 This is a general approach to working up thyroid nodules, as relevant for your preparation for the ABIM Internal Medicine board exam.